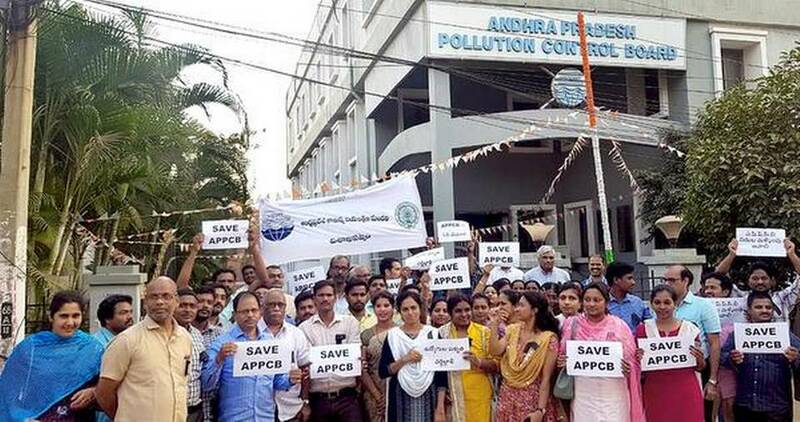 Employees of AP Pollution Control Board (APPCB) staged a lunch-hour demo outside their zonal office at Madhavadhara in VUDA Colony here on Monday in protest against ‘diversion of internal funds of APPCB’ to urban local bodies. The employees alleged that the State government had sought immediate diversion of ₹320 crore from the internal funds of the APPCB for discharging duties of the Urban Local Bodies. The APPCB had conducted a Special Board meeting on February 1 and proposed to transfer its own funds as directed by the State government. The employees said that though the State government was not allocating any funds to the Board under Plan and Non-Plan Budgets, the expenses for environmental protection, conducting environmental workshops and activities to create awareness among the public, construction/upgradation and running of laboratories and infrastructure development were being met through internal funds. The Board has to meet the employees’ pension and provident funds etc., from its own funds only. APPCB played a vital role, with limited employees, for the State in achieving first rank in the country in Ease of Doing Business. They said that the employees of APPCB throughout the State staged demonstrations at the respective Board/Zonal Office/ Regional Offices. They also said that protest would be intensified till the government dropped the proposal.